Publishing the score results of a match can be frustrating. It's difficult to get the results to everyone the way in which they would like it. We wanted to eliminate all the fuss and bring it down to a click of a button! Scores are displayed in many different ways for different purposes and preferences. Graphical scores analysis allows the shooters to visualize how well they did in comparison to the best shooter overall or within their division and class, stage by stage. Automated score alert notifications are delivered with a click of a button. 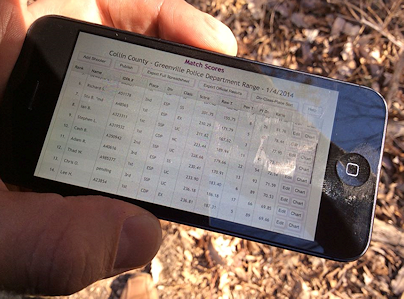 Scores can be viewed after the match or if you are entering results in real-time, the shooters can check theirs (and others') scores on their smart phone.